While delivering software as a service (SaaS) from the cloud has distinct advantages, the market is so filled with hype, it is difficult to decipher between what is myth and what is reality. When it comes to making a decision with your contact center, you need to have a clear view of the solution you are choosing before you enter the cloud. 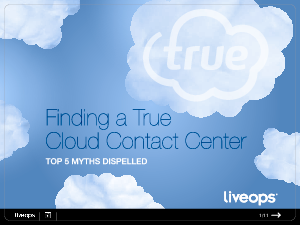 This eBook discusses the top five myths around choosing a cloud-based contact center and provides quotes from key industry players to help you understand the latest trends and bring clarity to your decision-making process.